This is the real deal. The store-bought version can’t touch this. Large bowl or measuring cup (to hold 4-5 quarts of liquid). Soak almonds in 2 cups of filtered or distilled water overnight or blanch almonds in boiling water for 60 seconds and remove brown skins on almonds. Add almonds and 1 cup of water to the blender. Have the remaining three cups of water ready. 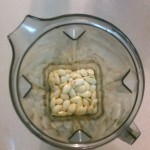 Skinned almonds in the blender. Start blender slow then build to high. Blend mixture until it begins flow slowly. Before mixture warms and stiffens, add next cup of water. Repeat step 4 & 5 except add the remaining water. Blend for up to 1-2 minutes, less if you have a high-speed blender careful not over heat mixture at any point. Gently and patiently squeeze nut milk bag to extract liquid while filtering sediment. Be careful not to damage bag. Rinse dates under warm water and remove pits. Return filtered mixture and add remaining ingredients to blender. Although it might be a little warm at this point…ENJOY! Soaking almonds overnight instead of blanching. Using a high-speed blender to maximize yield (e.g., Vitamix, Healthmaster, Blendtec). Himalayan (Pink) Sea Salt for the flavor we have enjoyed most. Non-alcoholic organic vanilla flavor instead of vanilla extract for better flavor. 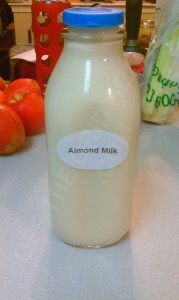 Enjoying almond milk cold, alone or as the base of a great smoothie.